Hello! Today I have another polish sent to me by the lovely people over at Queen of Nails. If you missed my last post for the UK stockist, you can find that here. They recently sent me over another one of the leather effect polishes from the OPI Grease Collection (I swatched the white, 'Rydell Forever', back in June here). Read on for my swatch and more info! 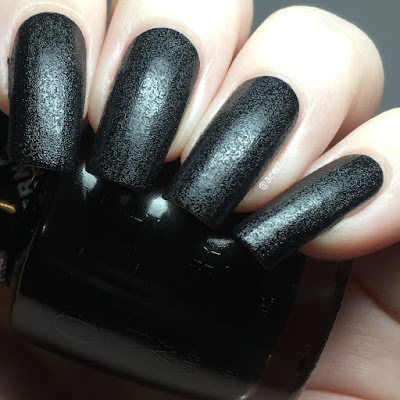 'Grease is the Word' is a black leather effect polish. It applies like any other polish, and has a smooth formula. It has a textured finish thats a lot more subtle than a traditional texture (like OPI's liquid sands). It's much finer and can easily be smoothed with topcoat if wanted. Below is two coats without topcoat. I've pretty much accepted the transition into Halloween nail art now, even though it's not quite October just yet. 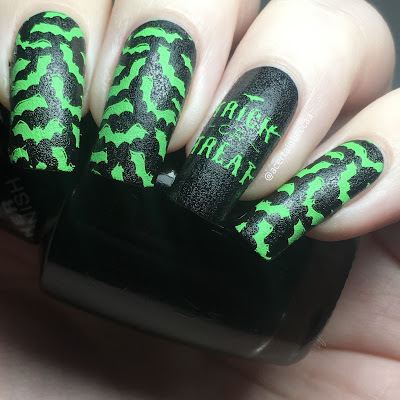 I stamped bats over 'Grease is the Word' using UberChic Beauty plate Halloween-01 and Esmaltes Da Kelly 'Bruce'. What do you think? I absolutely love the finish on these leather effect polishes. I did say when swatching the white that I needed the black and pink to finish the trio. Now that I have the black it's just the pink I need to get my hands on! 'Grease is the Word' is currently sold out on the Queen of Nails website, but you can find other shades from the OPI Grease Collection here.